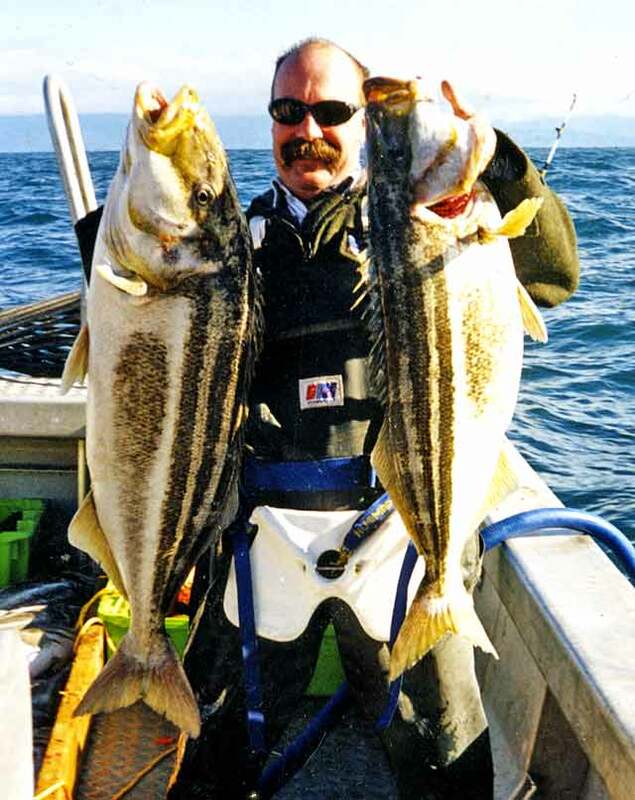 Tony Langdale-Hunt with a brace of massive trumpeter taken off the Canterbury Coast. A freshly caught trumpeter has a brightly coloured handsome appearance. 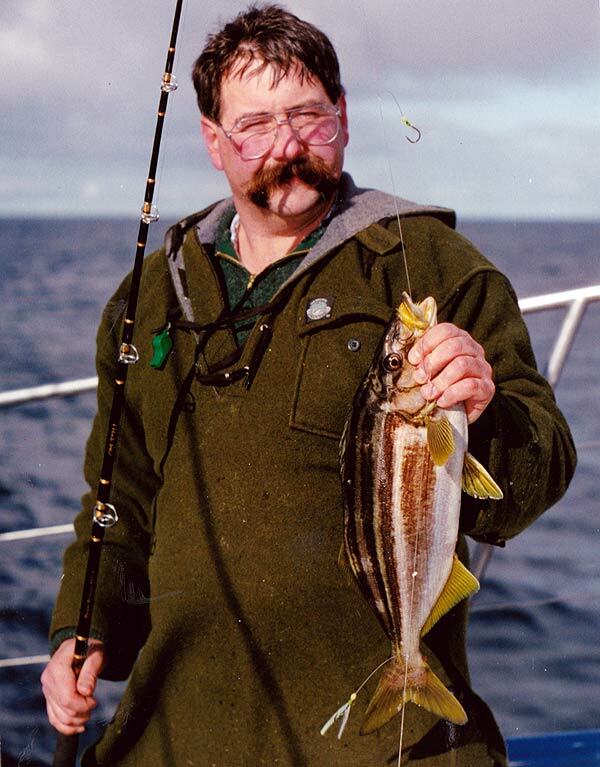 This one was caught by Allan Burgess fishing off Stewart Island. 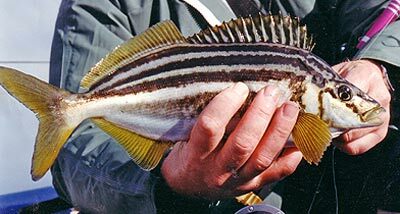 Trumpeter is a welcome catch for recreational anglers. 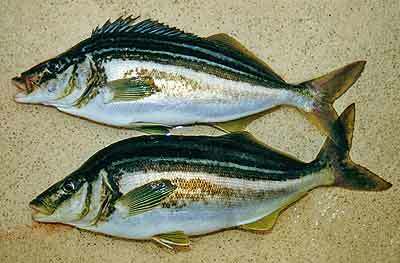 They are a fish of southern New Zealand with the Bay of Plenty being about their northern limit. They are more abundant along the east and southern coasts of the South Island. However, the trumpeter is rarely encountered other than in small numbers. 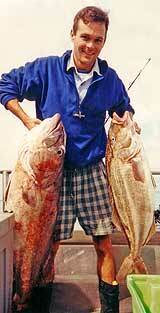 Occasionally trawlers will bring in a good haul of medium-sized fish. The best fishing grounds for them are off Kaikoura, along with the Pegasus Canyon, Foveaux Strait, around Stewart Island, and Fiordland, mostly over rocky foul ground, seamounts, and sunken reef systems. Like groper, they soon become fished out from the most popular and readily accessible spots. This is because they are such good biters with the bigger fish in particularly the first to be caught. It can take many years for them to re-occupy such an area. Dave Tucker with a fine brace of big trumpeter taken off the Canterbury Coast – 9.5kg and 11kg. A few years ago there were many large trumpeters to be found at Bushett Shoal – an isolated reef system south of Claverly on the Kaikoura Coast. Although close to shore this whole area was difficult to access with boat launching ramps at least an hour away by sea. Although Bushett Shoal still yields trumpeter the very big fish are now few and far between. To catch a big one a metre in length you would need to find a new unfished location! Trumpeters are powerful fighters on rod and line. They will readily take flasher rigs and jigs bounced along the bottom. You can increase your chances of a hook-up still further by sweetening your flashers with bait. 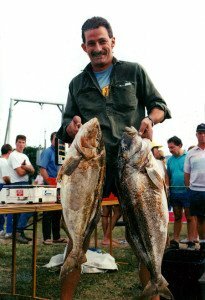 Just about any fresh bait will take trumpeter including yellow-eyed mullet, barracouta, squid, tarakihi, sea perch, and so on. Nowadays almost no one fishes with bait only. The flasher rigs are much more productive. This specimen taken off the Canterbury Coast is approaching the upper size limit for the trumpeter. Note how the bands have faded on this fish. and blue cod. So if you are catching these species a trumpeter is always a possibility. Trumpeter info on Fishbase.org. I have caught trumpeter several times in good numbers when fishing over foul ground off Stewart Island and in Foveaux Strait. They were taking both jigs and flasher rigs and were great fighters darting from side to side before being lifted aboard. Trumpeter moves inshore during summer and moves out to deeper water in the winter time. They are caught in shallow water of 20 metres down to as deep as 250 metres. The horizontal stripes running along its sides make the trumpeter immediately recognisable. These stripes are a bright olive green colour which quickly fades after capture. The fins and tail are yellow to grey. It can also be quite bronze or brown in colour. It is a very pretty fish to look at. An excellent brace of big trumpeter fresh from the sea. The outline of the trumpeter closely resembles that of the blue moki to which it is related. Indeed these two species share much the same habitat and eat much the same prey of shrimp, crabs, octopus, squid, and mussels. Trumpeter is one of the very best table fish. They can be cooked by all methods. A trumpeter caught fresh from the sea has bright vivid colours. They are also strong fighters darting from side to side and pulling strongly on the line. Click image to enlarge. Dave Craze with good eating size trumpeter from Foveaux Strait. 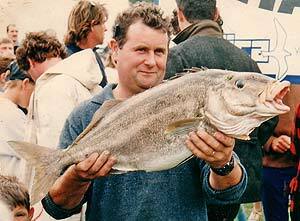 This is a very big trumpeter caught off the Canterbury Coast. According to David H. Graham, who was a marine biologist at Portobello near Dunedin in the first half of last century, he found a ripe female trumpeter which he estimated to be carrying an astonishing 12 million eggs. A prolific spawner indeed! It is sad when you consider just how few of these young will ever reach full maturity. This groper (left) and big trumpeter (right) were taken fishing in deep water over the Pegasus Canyon off the Canterbury coast. The trumpeter reaches 1m in length. Found mostly over rocky foul ground down to 100m. 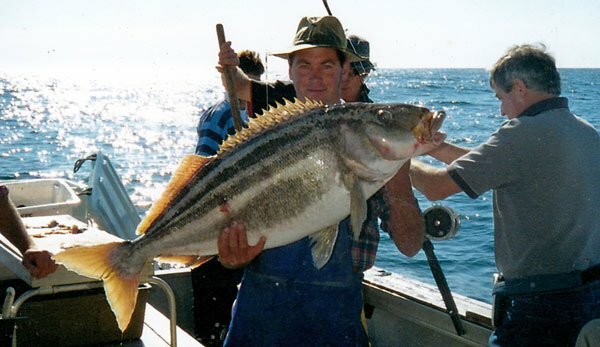 I remember members of the Canterbury Sport Fishing Club catching big trumpeter over Bushett Shoal south of Kaikoura. This area was for a long time difficult to reach by trailer boat so the trumpeter there were very big. Moki are crustaceans feeders. You are much more likely to catch them on crustacean baits like Swimming crabs (also called paddle crabs), cooked prawns and crayfish, than cut fish baits!